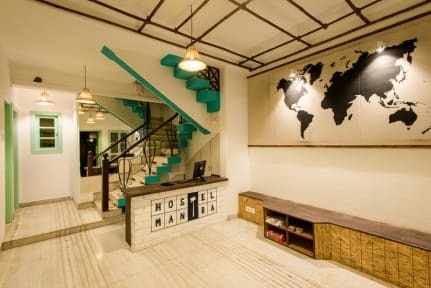 Welcome to Hostel Mantra, a community of travellers, explorers and wanderers. We at Hostel Mantra believe that travel is not just limited to sightseeing and ticking destinations off your list. We are located in the biggest suburban district of Mumbai - Andheri. Tucked away in a calm and peaceful neighbourhood, this green oasis is perfect place to relax and take some time out after surviving the craziness of this city. And if you still have some energy left, you can always head to the nearby bars, pubs or grab a bite at some really good restaurants. Western part of Andheri is very famous among the locals for its nightlife, and we want you to party like a local, with the locals. We have great connectivity to the nearest train station with a bus service right from our doorstep or you can just head to the nearest metro station which is simply 10 mins away. Feeling adventurous? Well, just hop inside a rickshaw and you will go zipping through the traffic in no time. We have an indoor and an outdoor common area, a rooftop chill zone, mixed dorms, female dorm, private rooms and a coconut tree in our backyard. All our dorms and private rooms have en-suite baths. You can use the kitchen to cook a meal. A simple breakfast is served to get your day started. We want to meet friendly and interesting people. Hostel Mantra is not a commercial enterprise. It is a community with heart and a chance to experience the real West-Mumbai. If you are coming from International or Domestic Airport the easiest way is to take a 30 minute cab ride directly to our hostel. If you wish to take the metro then you can walk 15 minutes from the International Airport to 'Airport Road' Metro Station and take metro to 'Versova' Metro Station. From there you can take a rickshaw which will take just 20 Rupees to get to our hostel. If you are coming by Train. You can take the metro from Andheri Metro Station to Versova Metro Station. Once there hop inside a rickshaw to get to us. Or you can enjoy a Rickshaw ride from either Airport, Train Station, Intercity Bus Stops to get to us. It is a teal and white color Bungalow no. 87 on the main Janki Devi School Road. Please do not go towards the school gate. All the houses have number in ascending order. Nearest Landmark is 4 Bungalows Telephone Exchange.